The writer is managing director and CEO, Centre for Monitoring Indian Economy. Consider the following: CPHS has a sample size of 1,78,000 households in comparison to NSSO’s 1,20,000. CPHS is necessarily conducted using hand-held GPS-enabled devices while NSSO surveys are done using paper with no tracking devices. CPHS data is validated 100 per cent in real-time by supervisors while the survey is being executed. NSSO validations are offline and mostly post-hoc. CPHS results are released within a few hours of the completion of the survey, while NSSO survey results are released after 6-8 months of the completion of the survey. All the record-level data and the source-code to derive the estimates is available for anyone to check the estimates. Given the much greater superiority of the CPHS machinery compared to the NSSO as described above, if there is any difference between CPHS and NSSO estimates, the benefit of doubt, if any, should go to CPHS and not NSSO. Nevertheless, one must not expect too much of a difference between the broad all-India level estimates of large surveys, and both the NSSO and CPHS are easily large surveys. So, CPHS estimates of female labour participation rates are comparable with the NSSO data as churned out by Bhalla. While I stand corrected on the use of the specific indicator, using the data suggested by Bhalla does not change the fact that two large surveys of NSSO and CMIE give estimates of female labour participation rates which are broadly comparable. Ergo, we must accept that female labour participation continued to fall post 2011-12. Note that the increase in the rate at which the female labour participation rate fell between 2011-12 and 2016-17 is not dramatic. A rate of fall of 1.11 per cent points per annum rose to 1.39 per cent points per annum. The dramatic fall comes after 2016, that is after demonetisation. This is when the female labour participation rate fell by a massive 4.93 percentage points in just one year. It fell from 16.37 per cent in the Wave (as one round of a panel survey is called) of May-August 2016 to 11.44 per cent in the Wave of May-August 2017. Male labour force participation rate fell by a lower 2.5 percentage points, from 74.76 per cent to 72.33 per cent during the same period. 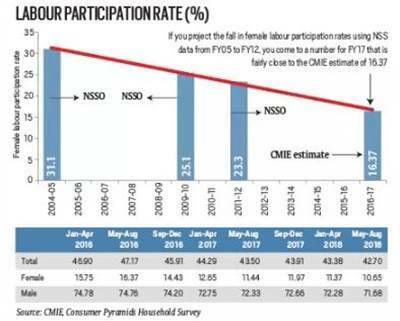 Given that CPHS female labour participation rates are broadly comparable with Bhalla’s estimates derived from unit level NSSO data till mid 2016, then he must accept the steep fall after the May-August 2016 Wave. This is because CPHS is a longitudinal panel survey. It repeatedly surveys the same households with the same questions. It also uses the same weights and estimation procedures.